From left to right: Ms Theresa MAY, UK Prime Minister; Mr Donald TUSK, President of the European Council. Copyright: European Union. - EU and UK agree to further Brexit negotiations. - Bank of England downgrade growth forecasts. The British Pound posted a strong recovery through the Thursday session, overturning a poor start to the day after markets sensed a distinct pivot towards a softer Brexit by the UK on the horizon. The Pound fell after the Bank of England announced that it is downgrading growth forecasts for the UK economy, but losses proved short-lived as markets keep one eye focussed on Brussels where it has been announced further Brexit negotiations between the EU and UK will take place while the prospect of Labour voting for a Brexit deal became more likely after the party softened its red lines and indicated it would work with the government to achieve a deal. Following talks, described as robust but constructive, both parties agreed to hold talks "as to whether a way through can be found that would gain the broadest possible support in the UK Parliament and respect the guidelines agreed by the European Council." The Bank of England maintained interest rates at 0.75% today and the Monetary Policy Committee (MPC) repeated the line "an ongoing tightening of monetary policy over the forecast period, at a gradual pace and to a limited extent, would be appropriate". Markets however picked up on the new forecasts contained in the Bank's Inflation Report which "strongly suggest that the MPC thinks rates may not need to rise as far as it thought a few months ago," says Paul Dales, Chief UK Economist with Capital Economics. This lead to a knee-jerk fall in the Pound. 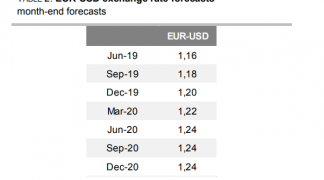 The Bank downgraded 2019 GDP forecasts from 1.7% to 1.2%, on the basis of “softer activity abroad and the greater effects from Brexit uncertainties at home”. "There’s plenty of short-term negativity in the Bank of England’s latest predictions, but there is still the subtlest of hints that they’d still like to tighten policy further if they can. That says to us that a 2019 rate hike shouldn’t be ruled out just yet, although as ever it all depends on Brexit," says James Smith, Developed Markets Economist with ING Bank in London. The forecast for CPI inflation in two years’ time was nudged down from 2.12% to 2.07%. The Bank's inflation forecasts are based on the markets’ expectation that rates will have been increased by just 0.25% by the end of 2020 - raising interest rates tends to have a dampening effect on inflation. This suggests to Dale the MPC thinks perhaps two 0.25% hikes would be required to hit the inflation target, which would be fewer than it implied in November. The Pound sunk as the market adjusted expectations for further interest rate rises lower. The rule-of-thumb for currencies is that heightened expectations for higher interest rates in the future are a positive for a currency, while the opposite is true when markets see fewer rate rises in the future. The Pound fell in response to the downgrades to growth, as would be typically expected, however weakness appears limited in nature. "GBP has retraced most of the knee-jerk weakness since the decision. We see little opportunity to get involved however, with downside constrained given that cable has come a decent distance already in recent days from above 1.32. We look to 1.2800/30 to offer crucial support with 1.30 as resistance," says Mazen Issa, Senior FX Strategist with TD Securities. Above: Sterling fell against the Euro at 12:00 GMT when the Bank of England released its latest Inflation Report. However, the losses have been trimmed as events in Brussels suggest to markets the Brexit impasse will ultimately be resolved. The Bank's forecasts and expectations for interest rates ultimately rely on the expectation that a Brexit deal will be struck between the EU and UK and the forecasts therefore rely on the current Brexit impasse being resolved before March 29. "Most paths now lead to an extension of the article 50 negotiating period, but if (and it's still a big if) the government can secure a cross-party consensus for a particular deal – for instance one that commits to a permanent customs union – then this may well be followed up with a Bank of England rate hike relatively swiftly," says ING's Smith. "If there’s a no deal then, despite the MPC’s suggestions, we think interest rates would be cut. But if there’s a deal in the next 3-6 months, we suspect that the rebound in GDP growth would be stronger than the MPC expects, perhaps resulting in growth of 1.5% this year and 2.2% next year," says Dale at Capital Economics. Captial Economics forecast UK interest rates will rise four times by the end of 2020, to 1.75% and the Pound-Dollar Rate to rise from 1.29 to 1.40.